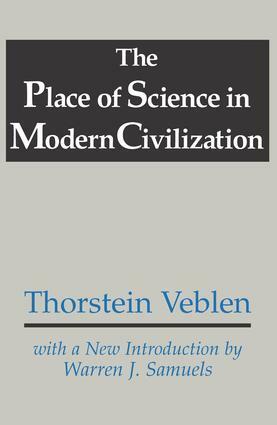 On its original publication in 1919, The Place of Science in Modern Civilization was recognized as a major contribution, and today Veblen continues to command attention and respect. This volume includes some of his most seminal work, essays that have critical, almost devastating implications for capitalist society and mainstream economic theory as well as Marxism and socialism in general. The continuing power of Veblen's work derives both from the penetration and range of his analysis and the arguable failure of modern society and social science theory to change in any material respect since he worked. The continuing relevance of his topics and ideas is manifest. In this volume in particular, Veblen addresses controversies over the relations of deduction and induction and efforts to produce truth, belief systems, and language, disputes about the significance of business mergers and acquisitions, and questions about the historical meaning and status of socialism. All of these are subjects of continuing interest and concern. The first six essays are fundamental contributions to the study of the preconceptions that drive thought and modern science and their origins. The next nine essays apply Veblen's thinking to critiques of other economists and capitalism. Three of these nine essays represent fundamental components of Veblen's view of capitalism and its problems are of lasting interpretive and analytic value. The final three essays in the book, and in particular the last two, are examples of a genre of thinking which, while not uncommon among social scientists of the period in which Veblen worked haven been discredited and certainly have no lasting value, being conjectural history using such concepts as natural selection.